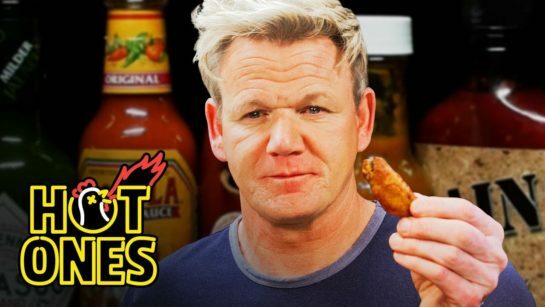 I never really thought about a ‘wish list’ for celeb guests on Hot Ones. But I think Gordon would make a lot of folks’ list of people they want to see hot sauce wasted (HA)! Gordon Ramsay is one of the world’s most decorated and successful chefs, with an empire that includes more than a dozen restaurants, countless best-selling cookbooks, and seven hit TV shows, including Master Chef Jr., which returns to Fox this February. But how is he with spicy food? Find out as the MOST-REQUESTED GUEST in Hot Ones history finally sits face-to-face with Sean Evans. Despite his misgivings about the culinary quality of the wings of death, Gordon throws himself into the challenge full force. Along the way, he discusses his chef influences, explains how to make the perfect scrambled eggs, and tries to find an antidote to spicy food.